The cast of SHE STOOPS TO CONQUER. Photo by PAT JARRETT. 2013. 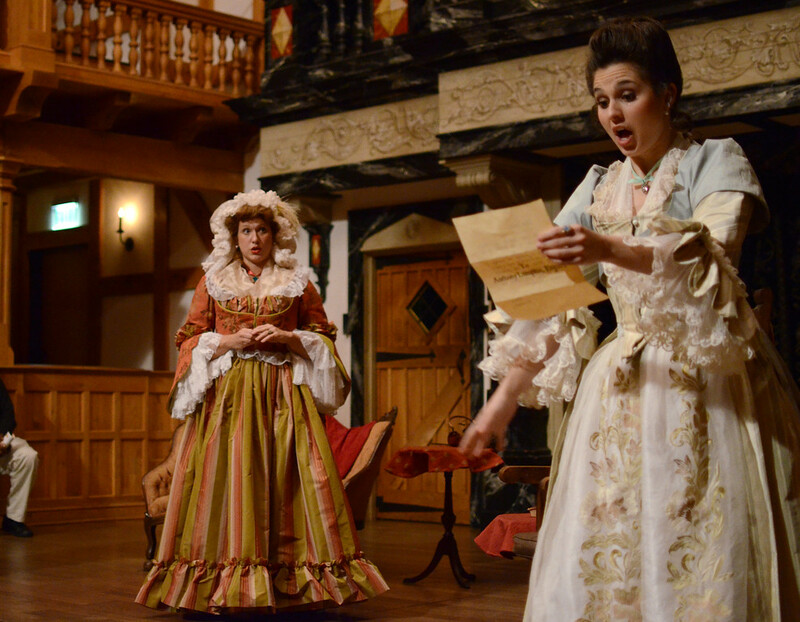 Allison Glenzer and Emily Brown in SHE STOOPS TO CONQUER. Photo by PAT JARRETT. 2013. 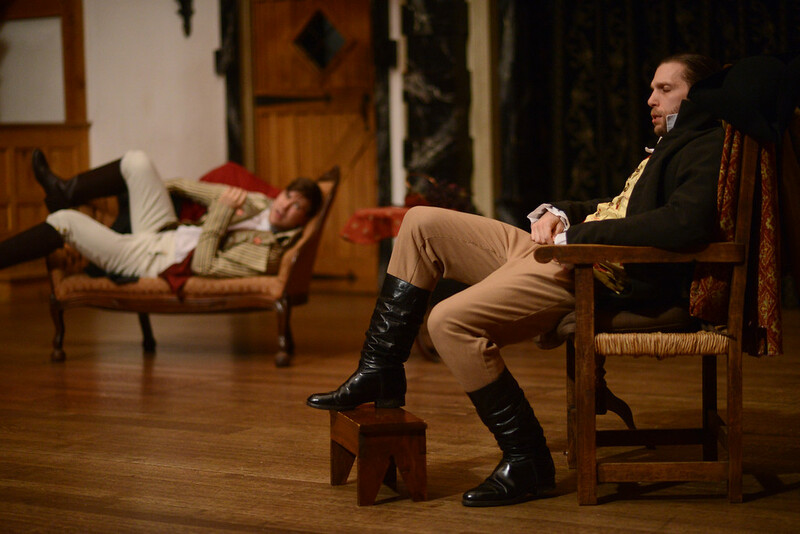 Lee Fitzpatrick and Gregory Jon Phelps in SHE STOOPS TO CONQUER. Photo by PAT JARRETT. 2013. 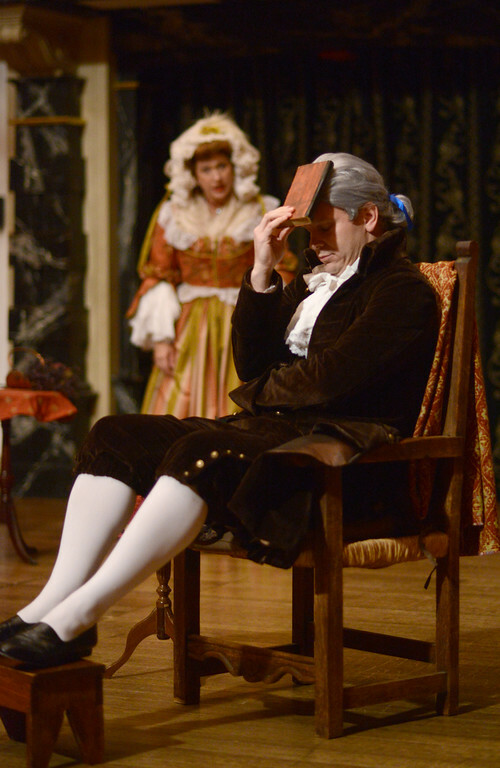 Dylan Paul and Gregory Jon Phelps in SHE STOOPS TO CONQUER. Photo by PAT JARRETT. 2013. 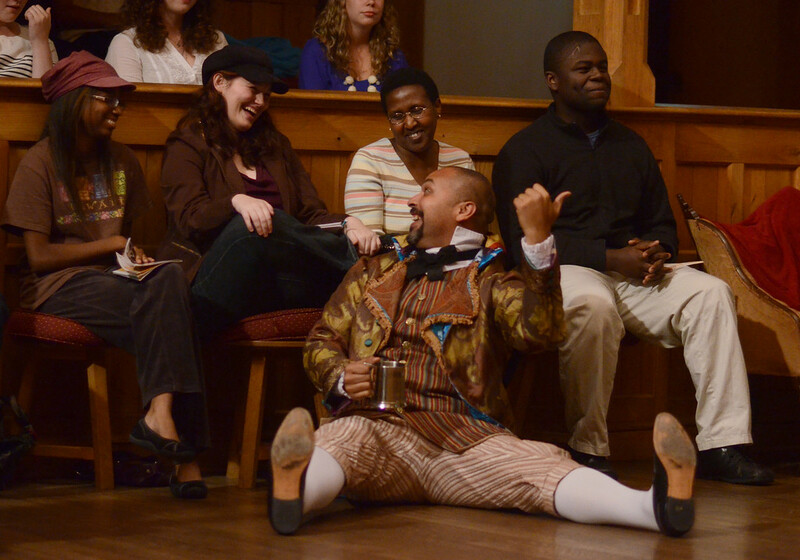 René Thornton, Jr. in SHE STOOPS TO CONQUER. Photo by PAT JARRETT. 2013. 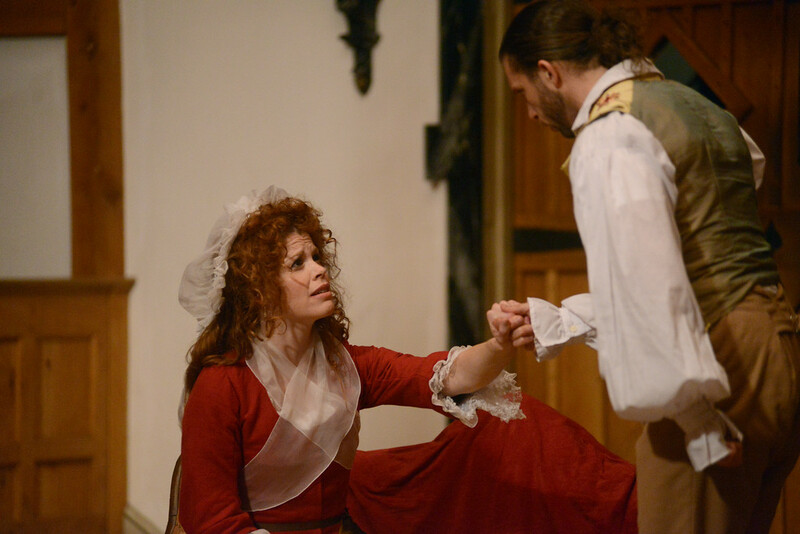 Allison Glenzer and Benjamin Curns in SHE STOOPS TO CONQUER. Photo by PAT JARRETT. 2013. 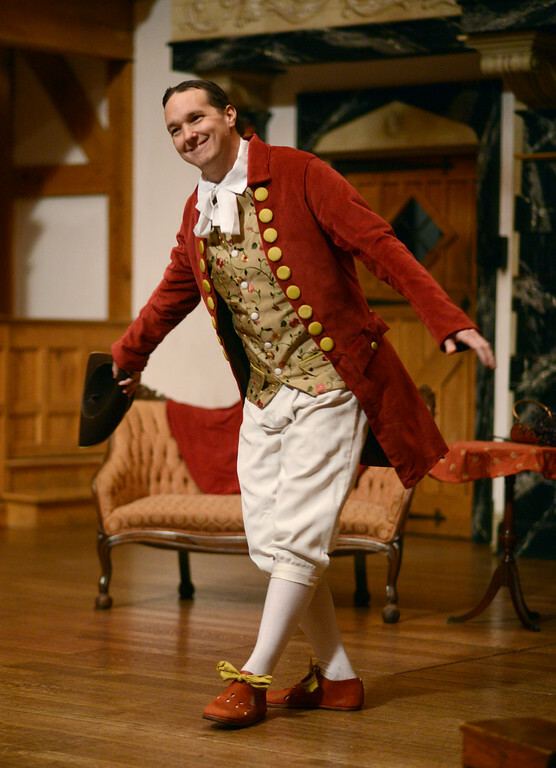 John Harrell in SHE STOOPS TO CONQUER. Photo by PAT JARRETT. 2013. 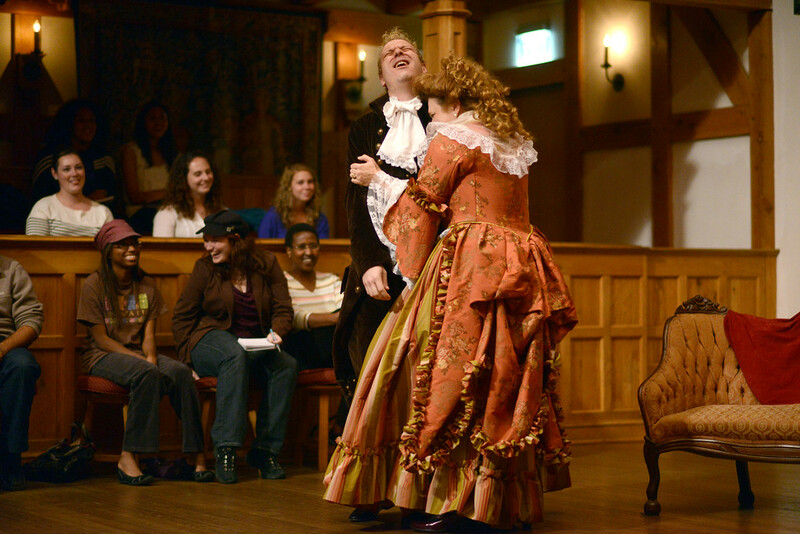 Benjamin Curns and Allison Glenzer in SHE STOOPS TO CONQUER. Photo by PAT JARRETT. 2013. Kate’s friend, Constance, is secretly pledged to George Hastings, who is traveling from London to the Hardcastle home with his friend, Young Charles Marlow, the man Kate’s father wishes her to marry. While drinking and carousing at an inn with some friends, Tony Lumpkin meets George Hastings and Young Charles Marlow. Tony concocts a plot: he convinces the two gentlemen that they are lost, but that “one of the best inns in the whole county” is very close. He directs them to the Hardcastle house and tells them to pay no mind to the old Landlord. Marlow encounters a more simply dressed Kate and mistakes her for a barmaid. He is witty and charming when he thinks he’s talking to a barmaid, so Kate encourages the mistake. Meanwhile, Hastings accepts the Tony’s “help” to elope with Constance and her casket of jewels. More deceptions, mistakes of a night, and a happy ending ensue. Oliver Goldsmith, the one-hit playwright, came along during the height of sentimental comedy in the second half of the 18th century. He drifted in and out of many professions in relative obscurity, gaining some notoriety as an essayist late in life. His second play, She Stoops to Conquer (1773), became a huge hit. He promptly died a year later. In spite of being the sole success of an almost unknown playwright, Stoops had an enduring impact on the world of comic theatre. With it, Goldsmith ushered in a new wave of humor that shunned the artificial, heightened, and cold qualities of sentimental comedy in favor of the gentle wisdom and big-hearted warmth of what he called laughing comedy. Sentimental comedy usually involves stereotypes: the heroine is reserved and romantic, the hero is bold and brave, and romance/love reigns supreme above all else. inhibitions of the hero and liberate him from his inability to relate to women of his own class. Although she disguises herself as a bar maid rather than a man to find “the cure,” Kate’s similarities to Shakespeare’s Rosalind and Viola are unmistakable, as is Goldsmith’s return to the boisterous FUN found in the long-gone Elizabethan comedies. 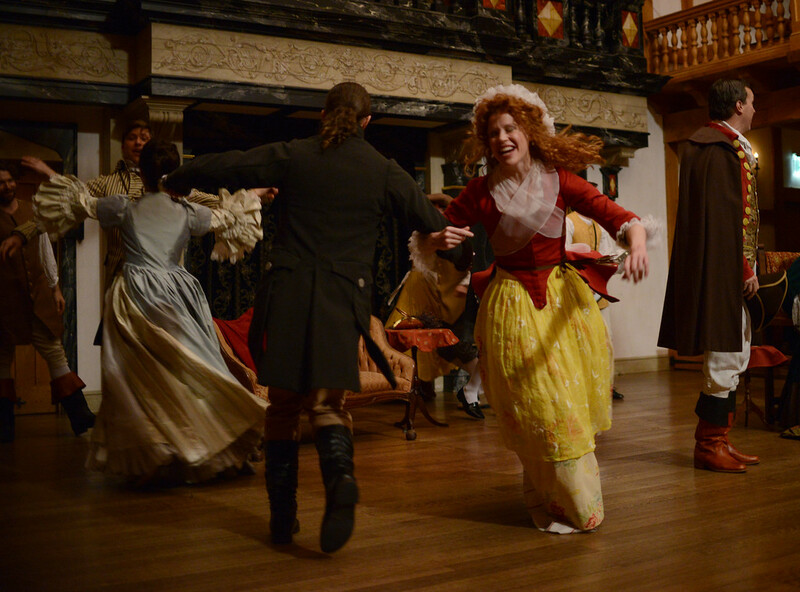 Audiences reacted enthusiastically to Stoops when it premiered in 1773 and have continued to do so ever since; it remains one of the few 18th century plays regularly performed for modern audiences. (In 2010, we produced the delightfulWild Oats by John O’Keeffe from 1779.) Goldsmith shot a much-needed dose of realism into the dull, sentimental plays of the period and his comedy is lively, witty, and imbued with an endearing humanity. Too bad he died before giving us even more at which to laugh. Goldsmith apparently accepted a Prologue written by the Drury Lane Theatre actor/manager David Garrick to be performed by the actor playing Tony Lumpkin, as an official part of the original script. Dr. Goldsmith himself wrote an Epilogue to be performed by the actor playing Kate after rejecting an Epilogue written by a friend to be performed by the actor playing Tony. With all of these Prologues and Epilogues flying about for the first performances, it’s no wonder that a tradition developed over the years in which many theatres have undertaken the task of writing original Prologues and Epilogues for their productions. I’m writing these notes before rehearsals start, but we will attempt to carry on that tradition. If you are amused, we thank you. If you are not, we blame Goldsmith.